Bright Martial Arts & Fitness (BMAF) seeks to promote Traditional Shotokan Karate through lifelong practice. With intense training in a disciplined environment, members will develop physically and mentally. All these aspects are important to Karate, and can be achieved through our interactive training. Members will be challenged and will feel energized and satisfied after each lesson. Sensei Carlsen Ma began his Martial Art training in 1985. Embarked on with Chinese Kung Fu, he took on other challenges such as Boxing, Kick Boxing, Taekwondo, WingChun, Karate, Arnis and Tai Chi. His Karate Black belt, grading under the world renowned Karate Sensei Hirokazu Kanazawa (Founder of Shotokan Karate International Federation in Japan). Sensei Ma has been teaching Karatedo, Taekwondo, Kick Boxing, Kung Fu and Arnis for more than 20 years. Along with his wife Sensei Karia Ho, a 4th Dan Karate black belt, they both had been participating Kumite (sparring) and Kata (forms) tournament for many years and won numerous titles. Sensei Ma and Sensei Ho want to pass on the advantage of training Martial Arts. The ability to protect one’s self, and the benefits of processing a strong mind would definitely be beneficial to all ages. Sensei Karia Ho has over 20 years training experience in Shotokan Karate. She began competing at the level of blue belt and has harvested lots along the way. 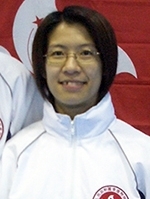 Because of her excellent achievement, she was chosen to be one of the member of Hong Kong Karatedo National Squad. There she practiced for few years. 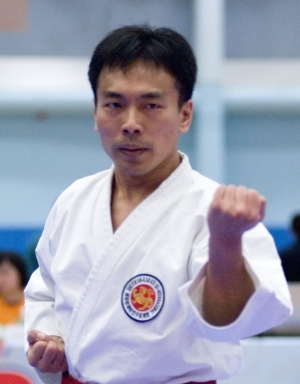 Now a 4th dan, Sensei Ho has competed in a multitude of Kumite events at national and international level. Now a mother of 2, she still enjoys the art of Karate very much and is passionate to pass on her knowledge and experience to BMAF members.